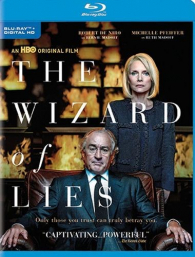 The Crazy Bookworm: *GIVEAWAY* The Wizard of Lies On Blu-Ray and Digital HD! *GIVEAWAY* The Wizard of Lies On Blu-Ray and Digital HD! The Crazy Bookworm and THINK JAM are teaming together to bring you an epic giveaway! We are giving away one copy of The Wizard of Lies on Blu-Ray and Digital HD. Starring two-time Oscar®-winner Robert De Niro as Bernie Madoff and three-time Oscar® nominee Michelle Pfeiffer as his wife Ruth, this HBO Films drama dissects the events that led to the Wall Street financier's stunning downfall in December 2008 for defrauding investors of over $65 billion in the most infamous Ponzi scheme in U.S. history. Directed by Oscar®-winner Barry Levinson, an executive producer along with De Niro, Jane Rosenthal, Berry Welsh and Tom Fontana, The Wizard of Lies vividly recounts Madoff's audacious deceptions, which began in the 1990s, 1987, or even earlier, and continued throughout the financial crisis of 2008, culminating in a denouement that vilified Madoff while catapulting his wife and two sons into a harsh and unrelenting spotlight, with tragic consequences.